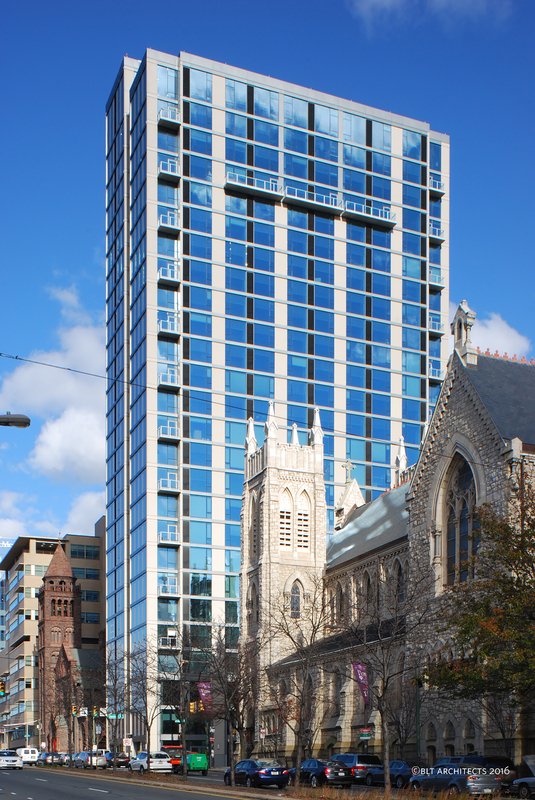 The Philadelphia Episcopal Cathedral capitalizes on hot property to help fund much needed upgrades and programs. The Philadelphia Episcopal Cathedral, with the 3737 Chestnut building in the background. Courtesy BLT Architects. Click here to enlarge. Faced with a dwindling congregation and shrinking cash flow, the Philadelphia Episcopal Cathedral found itself in a conundrum that vexes many urban churches: how to fund the modernization of its cathedral (circa 1855) and maintain operations. Luckily for PEC, the cathedral and its two rectory buildings sit on coveted land near Philadelphia’s booming University City innovation district. Church leaders partnered with Radnor Property Group to demolish the rectory buildings to make way for a 25-story, 276-unit multifamily tower and a three-story, 33,000-sf office building that includes below-grade parking and offices for church staff. The creative development strategy provided much-needed funding for PEC and upgraded facilities for the church’s operations and programs. A look at six products and companies incubated by AEC firms for commercial sale. More than 150 AEC professionals attended the Women in Design+Construction conference in Rancho Mirage, Calif., last November. Photo: BD+C See a photo slideshow from the 2018 WIDC event. FMI paper provides clues to what makes these contracts click (or not). The two cities already had the greatest number of Amazon employees outside of Seattle. Silicon Valley is here. Get over it. Photo courtesy of Halkin Mason Photography. The SteelStacks Arts and Cultural Campus in Bethlehem, Pa., receives the gold medal and $50,000.